“It is a great pleasure and honour for me to present the 2005 International Hydrology Prize to Gert Schultz. Gert was born in Wuppertal in what was then referred to as West Germany. He obtained a diploma in civil engineering from Munich, a Masters degree from the University of the Witwatersrand in South Africa and he returned to Munich to obtain his Doctorate in 1967. Within civil engineering, he specialized in hydrology, developing the first computerized rainfall-runoff model in Germany. For a couple of years he worked for a consulting company, before Erik Platte engaged him to lead research projects at the University of Karlsruhe. There he developed further his interest in water resources management and obtained his habilitation, the key to his long and distinguished carrer as a university professor. It was during this time that we first met, appropriately at the much-quoted Symposium on Mathematical Modelling [check for correct title] convened by IAHS in Warsaw in July 1971. Some six years later, he was engaged to head the newly-established Hydrology and Water Management Institute at the University of Bochum in the position of a full professor – a position that he held until his retirement four years ago. Gert´s academic career involved a one-year sabbatical leave which he spent touring water institutes in the USA, but he has also been engaged over the years in numerous consulting projects in Africa and Asia and it is from this close association with the practice of hydrology that he gained his passion for the application of our science to real-world problems, in particular the use of remote sensing, that is so evident in the many papers that he has published – something over 160 in total. It is worth noting that a quarter of these papers are to be found in IAHS publications and so Gert must rank as one of the most faithful IAHS authors. However, his contact with developing countries has not been restricted to the role of visiting expert. He has been very active in arranging for overseas students to study in Bochum and he has a world-wide reputation as a great teacher. I recall the lectures that he gave to a class of some 250 in Nanjing back in 1978, patiently and slowly presenting his material under the restriction of sequential interpretation – not an easy task for any speaker! I have mentioned the many papers that Gert has published, but his output has also involved work with WMO and UNESCO. In the early 1970´s he contributed to the second edition of the WMO Guide to Hydrological Practices and in the 1980´s he served UNESCO as their Rapporteur on Remote Sensing. He was also a member of the WMO/UNESCO Joint Working Group on Hydrological Data for Water Resources Projects [check title]. He is therefore one of the many who have been associated with all three of the organizations which support the International Hydrology Prize. Using IAHS as an avenue for publishing papers is welcome, of course, but Gert went further and offered his serves to the Association and during the 1980s and 1990s he held many positions, including Vice-President and then President of ICRSDT, Associate Editor of HSJ, Chair of the IAHS/WMO Working Group for GEWEX and member of the IAHS Bureau. More than this, in 1998 he joined with our good friend Chris Leibundgut to found the German IAHS National Committee. IAHS, WMO and UNESCO, but more – from 1991 to 1994 Gert was a Regional Director and then Vice-President of the International Water Resources Association. While, at national level, he served for many years on the Senate Commission for Water Research and as a member of the Board of Directors of the German Water Resources Association. if my parents were still alive, my father would be very proud of me today and my mother, she would have believed every word, you said, Arthur! I wish to thank you, Arthur, very much for your friendly speech, I want to express my gratitude to those, who nominated me, to the jury who selected me and to IAHS, Unesco and WMO for the prize. When the past IAHS president John Rodda sent me his congratulations, he wrote „I am very happy that you are joining the band“. I am not quite sure, however, which instrument I am supposed to play in the band, if we were a musical band. If I look at the famous squad of the previous prize winners I am afraid, I may be good enough only for playing the triangle or the drum or perhaps the third violin. 1. Prof. Des Midgley from South Africa, who was the supervisor of my Master`s Thesis in Johannesburg. 3. Prof. Erich Plate, with whom I did my Habilitation work to become a senior lecturer at the University of Karlsruhe, Germany. Furthermore I wish to thank the large number of highly qualified colleagues, who worked with me at the Ruhr University Bochum. I have often been asked: “how come that you became a hydrologist and not - as Civil Engineer – a hydraulics man or an expert in hydraulic structures?“ The answer is simple. When comparing my early scientific work at a hydraulics lab with my activities in hydrology I made an interesting discovery: in the field of hydraulics we were able to improve the efficiency of some hydraulic structures by say 3 to 5 %. In hydrology, however, we could improve the efficiency of water management systems by something between 20 and 25 percent. And thus I decided to invest my modest intellectual capital, where I got the higher interest rate! On the basis of these 2 maxims the research program was established and combined with consulting work in Germany and other countries, mainly in Africa and Asia, in order to verify our research results in practice. Now I wish to say a few words, how I personally experienced IAHS over more than 3 decades. If I compare our association with other national and international associations , of which I am a member, I must say that IAHS is unique! This is due not only to the fact, that it`s hydrologists are working on a very high scientific level, it`s rather due to its members and the way, they deal with each other. In other associations I am Dr. Schultz, in IAHS I am Gert, in others we are colleagues, here we are friends, in others there is rivalry, here nobody grudges anybody anything, in other associations they have formal dinners with boring speeches, in IAHS we have banquets, were we sing – all together or country by country! It is this spirit and attitude, why I like so much to go to IAHS meetings and why I am happy to have become an IAHS prize winner. Belonging now to this band I had a closer look at the previous prize winners and came to the conclusion that most of them are not only excellent scientists, but also real characters. So I thought, it might be worthwhile to shed some light on two of these characters, thus getting some insight into the psychology of International Hydrology Prize winners. Example 1: Eamon Nash from Ireland, the inventor of the famous „Nash-Cascade-Model“. 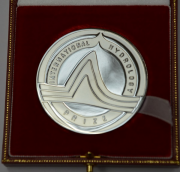 Hydrology Prize 1989. Eamon and I got to know each other quite well while we were giving a hydrology course in 1978 in Nanjing, China, on behalf of WMO briefly after China had opened to the world. So Eamon and I had to spend most of our time in our hotel with things like learning to eat with chopsticks. Thus we tried and succeeded in eating single peanuts with chopsticks. Then Eamon suggested: “let`s try to eat 2 peanuts in parallel with chopsticks“, which is rather difficult. Eamon succeeded, I did not. Example 2: Igor Shiklomanov, from Russia, Hydrology Prize 2001. Igor and I served for many years as members of the Scientific Steering Group for GEWEX, a major research project of the World Climate Research Program. We had our annual meetings in many cities of the world and one year we met in Frascati, Italy. One day a group of us walked through town to find a restaurant for dinner. We were surprised to see Igor carrying his bag all the way and told him, he could have left it in the meeting room. But Igor said, „You wait!“. Later, in the restaurant we ordered our food and wine and I was served a soup. When I started eating, Igor said with a smile: “Gert, you can`t eat your soup that dry!“. I asked: “what do you mean by a dry soup?“ He then just opened his bag, pulled out a bottle of good Russian Vodka and started to pour some Vodka into my glass. We were rather surprised and said: “Igor, you should`nt `t do that, the manager of the restaurant may not appreciate it!“. So Igor, who had brought the bottle all the way from Russia – not for his own delight, but rather to bring some pleasure to his international friends - said a little disappointed : “I will put the bottle away only under the condition, that you will drink some Vodka with me in my hotel room after dinner“. So we agreed and had a very pleasant dinner. When being back in the hotel Igor requested our presence in his room, each with his toothbrush-glass in hand. He poured a big chunk of Vodka into our glasses and we made bottoms-up and shouted „Nastravje“. Around midnight we wanted to go to bed. But Igor said: „not before you have finished the Vodka“. So we drank the whole bottle and eventually staggered along the hotel corridors back to our rooms. The next morning we were late at the meeting and had headaches, but remembered joyfully – thanks to Igor - an unusual evening and night. Hydrology and meteorology grow together. We can hope now that after, say, 10 years there will be coupled atmospheric and hydrological models being able to produce ensemble predictions of future conditions in hydrology (e.g. after a climate change) with a reasonable degree of accuracy expressed in form of a narrow bandwidth of the predictions. Then, hopefully, the proliferation of more or less useless modelling results based on just one single GCM and only one single set of initial and boundary conditions pretending to predict climate change impact on hydrology will come to an end. Presently we observe a fascinating development: hydrology moves away from its monodisciplinary perspective. Since the principle of Sustainable Development became dominant, it is necessary to consider the impact of hydrologic modelling results and their consequences on several other disciplines. It became necessary to quantify and evaluate this impact not only on technical systems, but also on ecology, economy and social conditions. This recently gave rise to many complex multidisciplinary research projects, some of which intend to develop formalized Decision Support Systems which will help to find good – if not optimum - solutions for the benefit of mankind. A really fascinating task! I was glad to learn this morning that the “Hydrology 2020” Working Group of IAHS , in its present report, sees this interdisciplinary approach also striving for “desperately needed holistic solutions”. Ladies and gentlemen, Eamon Nash once had to give a General Report at a symposium and was speaking for too long – like me – and the chairman indicated that he should come to the end. So – in the middle of a sentence – he interrupted and said: “the chairman tells me to shut up and go away, and that is exactly, what I am going to do“. And that, Ladies and Gentlemen, is also exactly what I am going to do now.